STOP! Are you really about to eat that nasty ol’ bean salad covered in all that oil and fat? UNnecessary and NOT HEALTHY. 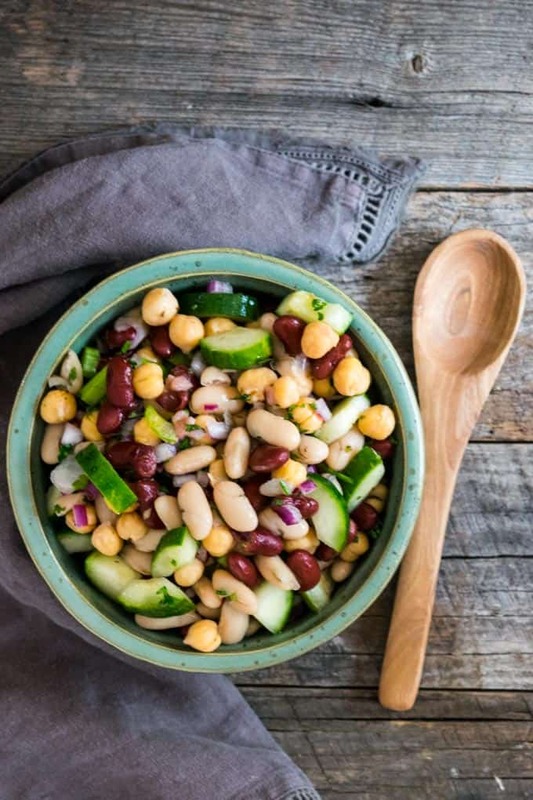 Make this oil-free Three Bean Protein Summer Salad and RESPECT YOURSELF. It’s full of flavor, LOW-fat, and delicious. Summer is here and man, it’s hot! The last thing you want to do is heat up a stove and cook. You need something quick, simple, refreshing and loaded with nutrients. 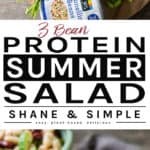 You need Three Bean Protein Summer Salad. 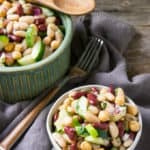 I know things like bean salad are usually considered picnic food. 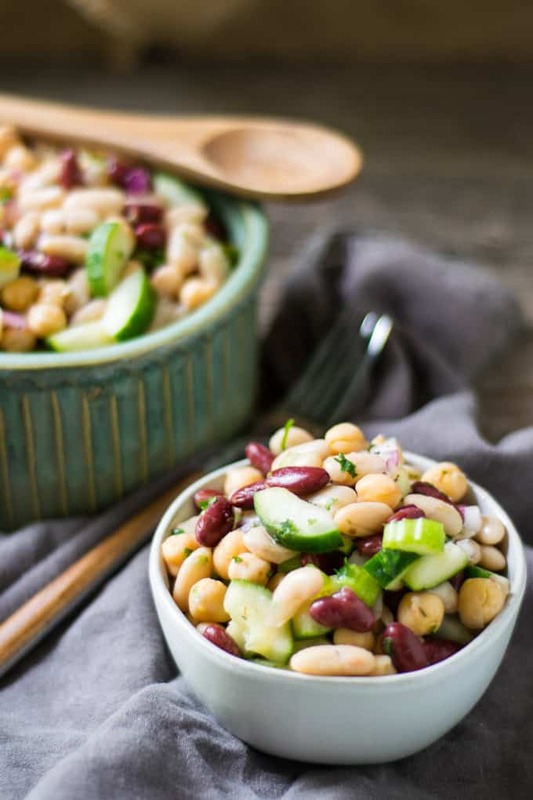 But, this Three Bean Protein Summer Salad needs to be on your short list for summer family dishes. It’s oil-free, loaded with protein, low-fat and delicious. Fresh and clean, baby. Beans are a modern day superfood and have been around for centuries. They’re also what the gladiators ate. That’s right! Check out this article. You need beans in your diet. They provide tons of vitamins, minerals and antioxidants. And, they’re loaded with protein. Beans have little to no fat and are cholesterol-free. And, beans actually lower cholesterol and triglyceride levels instead of causing them to increase. Okay, enough with all the health info. What about flavor? Celery, red onion, fresh parsley and a tangy-sweet, oil-free dressing bring this thing to life. The taste is pure electric. This is great all by itself, but get creative. You can serve it on top of some mixed greens, mix in with some noodles, or even make a wrap. It’s your world so go crazy. 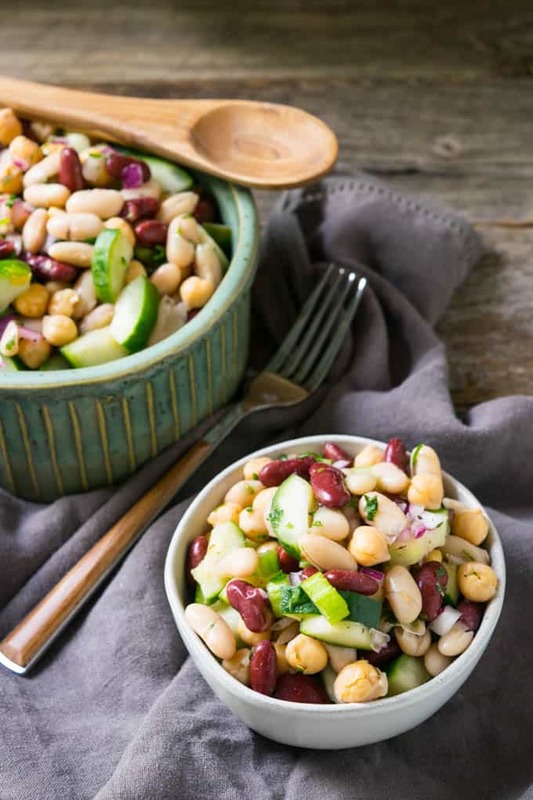 Simple, but delicious, three bean salad, perfect for summer. 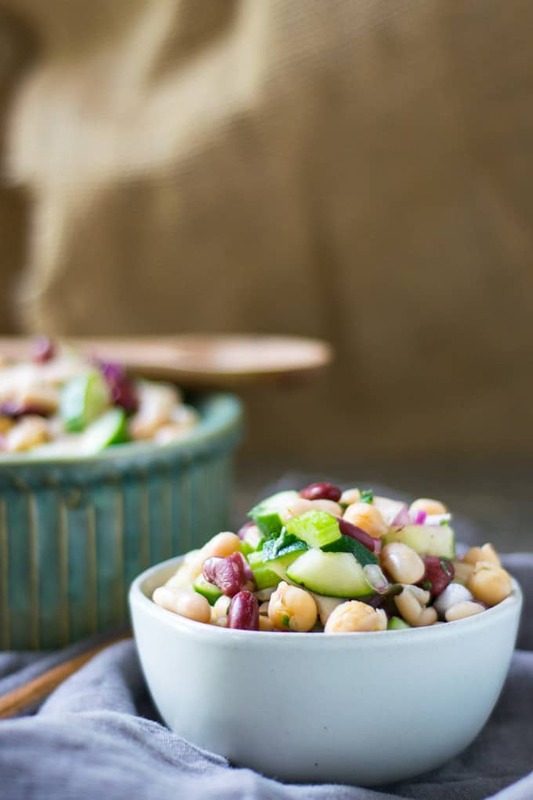 Made with pinto beans, red kidney beans, and chickpeas that are brought to life by celery, red onion, parsley and a tangy-sweet, oil-free dressing. Dice the onion and celery – add to a large bowl. Deseed the cucumber, first, by cutting in half lengthways. Next, scoop out the soft seeds by running a teaspoon over the seeds. DON’T DIG INTO THE CUCUMBER! You want to leave the “meaty” part of the cucumber. Now, cut in half lengthways again and dice. Toss into the bowl with the onion and celery. Mix dressing ingredients in a measuring cup or small bowl, pour over salad, and toss well. Let chill in the fridge for a couple hours so the beans can absorb all the flavors. But, if you can’t wait, go ahead and eat. But, you really should practice patience. *Nutrition info based on 6 servings. *If you can’t find low-sodium or no salt added beans, use regular beans. Just be sure to drain and rinse very well. YUM! Sweet and tangy. And, the fact it is chilled makes it a great meal or side for a hot summer day when I don’t want to cook. Thank you! Gonna try. How would it taste with zero added salt? By the way, I shop Whole Foods, too. I see that’s where your beans are from. The Whole Foods brand import the beans; they are not from the USA. 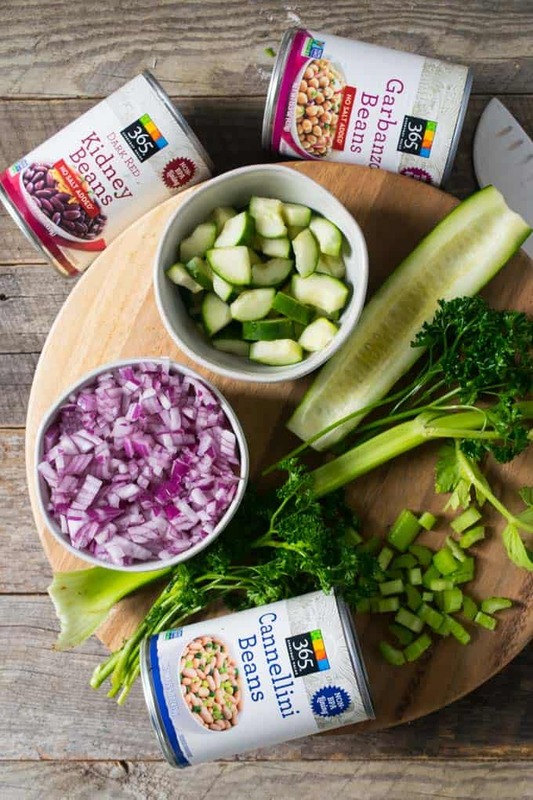 Eden Organic’s beans are all from the US; the can even states which states the beans are from. IMO the taste is better with US beans; perhaps just bias. But much better for planet to consume local; the more local the better. Jim, it all depends on your taste buds. I usually make without salt but I’ve been low sodium for several years and can’t take much salt. Use your own judgement. And, I agree buying local is always best. But, sometimes we have to go with the most cost efficient option. We have 5 kids and food can’t get pretty expensive. That being said, there are certain things we only buy local. Hope you enjoy the recipe!!! Thx Shane for response. I made it tonight without adding any salt. Considering the no salt; it was very good. It’s very difficult, if not impossible, for food to taste as good without salt; your recipe is impressive. Sure enough, while in Whole Foods today buying ingredients; I noticed that their brand does now have some varieties from the US. Perhaps due to Trumps tariffs LOL (I do want tariffs on all imports; food, bicycles, tools, auto parts, everything). Enjoyed!